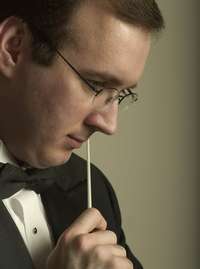 Jeffrey Shaull was named the director of the Spring Garden Band in 2003. In 1992 he joined the horn section of the band, and became principal of the section in 1997. Jeff is the assistant principal horn in the York Symphony Orchestra and a private horn instructor. Jeff is a graduate of Red Lion High School where he studied under past Spring Garden Band director, John Gouker. Receiving a B.S. in music education in 1993 and a M.M. in horn performance in 1998 from West Chester University, Jeff currently teaches music in the Wallingford- Swarthmore School Disctrict. He is an elementary and middle school band and orchestra director. Jeff is also an accomplished church organist in suburban Philadelphia. He is a member of the Organ Historical Society and The Friends of the Wanamaker Organ. He studied with concert organist and recording artist Dr. Gordon Turk. Jeff enjoys arranging orchestral music for concert band and young orchestras. His arrangements have been performed by his student ensembles, the Spring Garden Band, and the Chester County Concert Band. Jeff enjoys season tickets for the Philadelphia Phillies and the Philadelphia Orchestra. He resides in West Chester, PA.